How to Hatch Chicken, Duck or Turkey Eggs. How to help baby get out of shell. 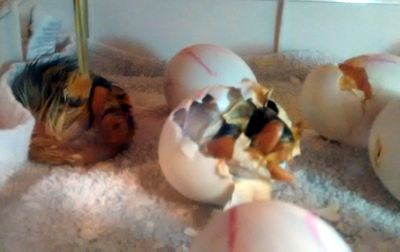 Hatching can take place over several days. 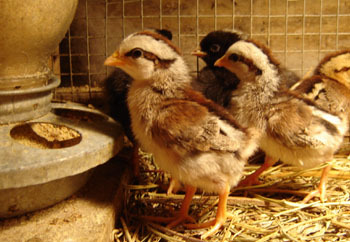 For chickens, run the incubator for 24 days (3 days more than normal hatch time). 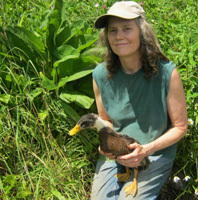 For ducks and turkeys run the incubator for 32 days (4 days more than normal hatch time). 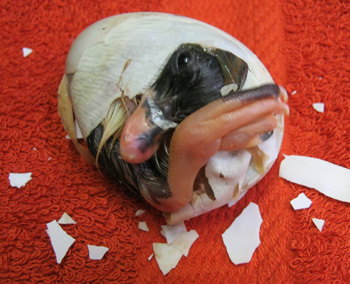 It is better not to help a chick/duckling/poult crack out of its shell. If you do, they almost always die (unless you follow the instructions in the next paragraphs). 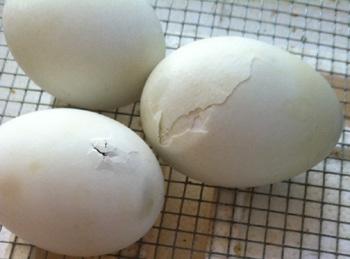 It is usually 12-18 hours from pipping (first hole in egg) to hatching, though it can take up to 48 hours. It is called unzipping when the baby chips at the egg in a circle. When a baby becomes too large to get oxygen through the egg shell pores, it uses its egg tooth to make a hole in the air sac at the flat, fat end of the egg. 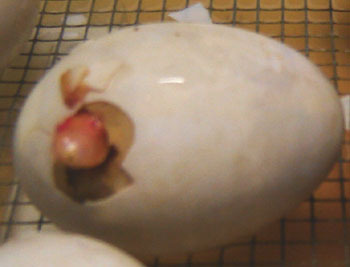 The egg tooth falls off a few days after hatching. 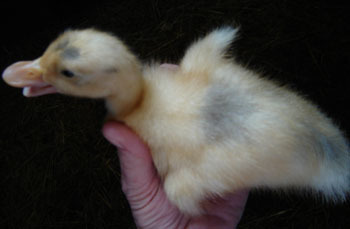 Pipping is when chicks, ducklings or poults start pecking on their shell so they can get out. They peck in a circle so the egg falls apart in half or so. The egg to the left is a chicken egg. You can see the beak at the top of the hole. Inside the shell are 2 membranes. The inner membrane controls blood flow to the chick/duckling/poult, and the outer membrane holds moisture. 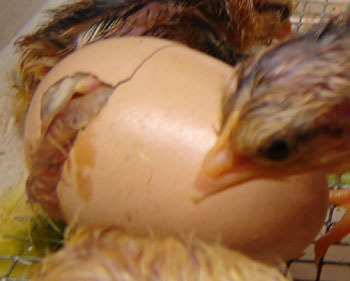 The chick breaks the shell slowly and controls the stopping of the blood flow. It can take 12 hours or more for the baby to come out of the eggshell once it first puts a little crack in the egg. It usually only takes an hour or so. Make sure humidity is high during hatching. You may need to spray eggs with a little water. Only open incubator when absolutely necessary to keep in moisture. The eggs to the left are duck eggs. "When I was helping them out of the shell and cut into the membrane to get them started on coming out, they would start to bleed a little. I would wrap them partially in a damp paper towel and just let them sit for a couple hours in the incubator. The dampness raised the humidity so high that fluid started building up in the eggs close to their yolks. One died within minutes of wrapping it and another several hours after helping it. In fact we almost had the last one in a position to come out. If you do want to help a hatch that has already started (chick/duckling/poult has made a small hole in egg), then take egg out of incubator and go to a warm place. With dull tweezers, remove a little bit of the egg shell around the hole. Do not remove any of the inner membrane. Do this in a circle around the shell like the baby would do it. Put the shell in the tweezer and pinch off small pieces. While you are doing this, keep the egg membrane moist with warm water in a dropper. The key to this is keeping the membrane moist. Do not drown baby. If you see blood, stop. After cracking around some or all of the egg, wrap a warm, very wet piece of washcloth around the cracked parts of the egg. Do not cover the beak. Put back in incubator. 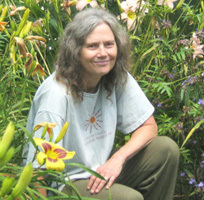 The beak should be on its side or facing up. 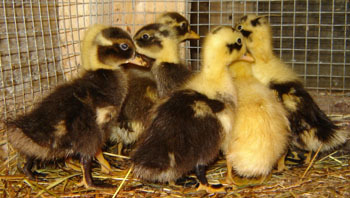 Remove chicks, poults or ducklings from the incubator once a day. 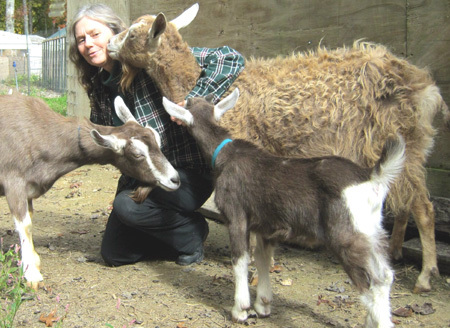 They can live for 48 hours without food or water. 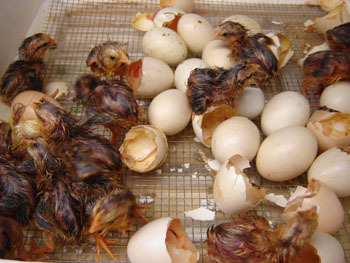 You only remove once a day so the incubator maintains stable temperature and humidity. Some incubators have a small plug you can remove to help reduce humidity while babies dry.